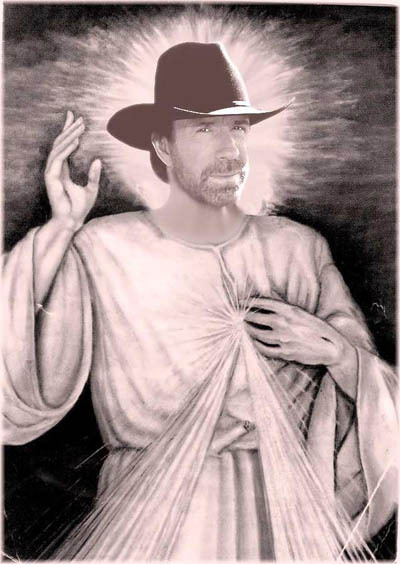 Why Is Chuck Norris Predicting A Thousand Years of Darkness? Now there's a headline I never thought I'd write. As you no doubt know, 72-year-old former action star Chuck Norris has filmed his own unique endorsement for Mitt Romney, in which he and his wife urge Conservative Evangelical Christians to vote against the coming Obamapocalypse. If Christians do nothing, warns Norris, this great nation is facing "a thousand years of darkness." Watch it below, or look at the transcript here. Man, that "thousand years of darkness" sure sounds bad. Also, very specific. Where in the Bible, you might wonder, is it prophesied that free health care will switch off the lights for a full millennium? Here's the funny thing: nowhere in the Bible is there a reference to "a thousand years of darkness." It sounds just like something from the Book of Revelation. But it's not. 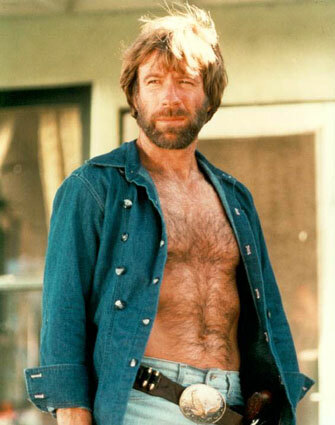 So if Chuck Norris isn't spouting Biblical prophecy, what the hell is he talking about? But that still doesn't explain where Reagan got his thousand-years calculation. We know it's not from the Bible. Why does it sound so familiar? Here's the irony. The phrase "a thousand years of darkness" was originally used in the 14th century to describe the European Middle Ages, a period when science and learning were in decline, war and famine were rampant, but the church was thriving. It wasn't Christianity's finest hour -- the church was divided, corrupt, and with the exception of some noteworthy individuals, generally a mess -- but it still managed to exercise a tremendous amount of power over people's minds, hearts and wallets. Sounds like Chuck Norris's personal Disneyland to me. In continuing with the "irony" theme, agnostic astrophysicist Carl Sagan adapted the phrase for his 1980 miniseries Cosmos. For Sagan, "a thousand years of darkness" described the period following the destruction of the Library of Alexandria, the ancient world's great archive of knowledge. He was using this as an example of the dangers of fundamentalism, or in his words, "submission to national, religious or ethnic identifications." Back to Walker, Texas Ranger. It's a safe bet that Chuck Norris didn't spend a whole morning Googling "thousand years of darkness" (ahem) in order to put Reagan's words in context. He chose to use the speech; it resonated with him. And it resonated because it really, honestly sounds like something from the Book of Revelation. Norris is talking about the End Times here. And that said, most of what Christians believe about the Apocalypse doesn't actually appear in the Bible at all. There are a thousand different "timelines" of the events of Revelation (a decidedly non-linear piece of writing) that one could pick and choose from. Most agree that Christ will reign for a thousand years of harmony prior to the Final Judgement. Perhaps there are some who believe that the anti-Christ will also reign for a thousand years? For symmetry? Anyhow, if Lyndon B. Johnson did usher in a thousand years of darkness when he was elected, then we are currently in Year 48. Only 952 to go! Welcome back everyone! It's been a while since we've God Spam'd together, and there's so very much to catch up on. Chick-Fil-A. Hollywood Bible movies. The first Mormon Presidential candidate and the first Mormon-themed Broadway musical! It's all a little much to jump into at once, so let's start with something simple. This is the new promo image for The Expendables 2, modeled after Leonardo Da Vinci's The Last Supper. Interesting choice, seeing as there's no food at this table; just semi-automatic weapons, bottles of booze, and artfully arranged platters of grenades. On the other hand, there are twelve action stars flanking Sylvester Stallone, just as twelve Disciples surrounded Jesus in the original artwork. (It's far too early in the morning to address the Sly-Stallone-as-Jesus issue.) Which makes the arrangement seem kind of inevitable. You can just imagine the art department at Lionsgate scratching their heads, going, How do we fit 13 stars equally into one eye-catching image? And really, no one has come up with a better composition than Leo did 500 years ago. 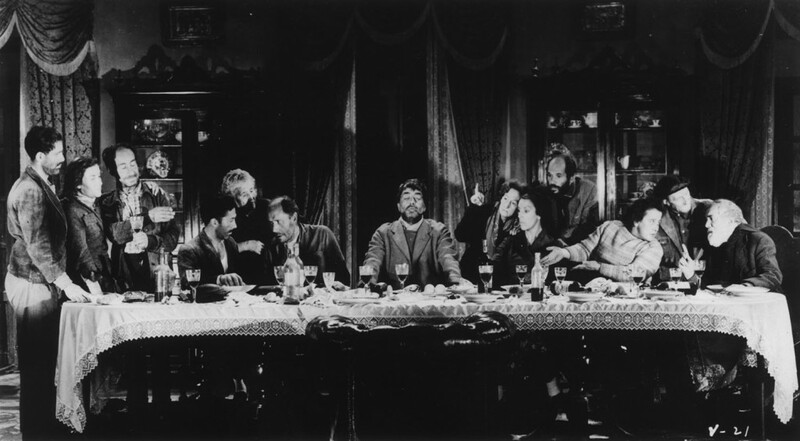 In contrast, here's the very first Last Supper parody in pop culture history (as far as I know), from Luis Bunuel's 1961 film Viridiana. The film, a satire of Catholic hypocrisy, was banned outright in Spain, with this scene being the most controversial. 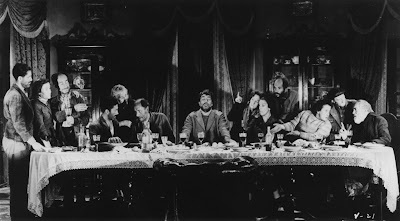 It's clear that Bunuel chose this particular scene for a reason -- not just because he had thirteen actors who needed to be aesthetically arranged.